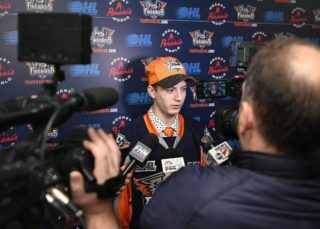 Flint, Mich. – The Flint Firebirds announced today that the club has selected forward Evan Vierling (pronounced Veer-Leeng) as the second overall pick in the 2018 OHL Priority Selection presented by Real Canadian Superstore. Vierling, a native of Aurora, Ont., recorded 63 points (27G, 36A) in 33 games last season with the York Simcoe Express Minor Midget AAA hockey team. He also finished third in points among 375 skaters at the 2018 OHL Cup powered by Under Armor in March. He scored five goals and added five assists, totaling 10 points and recorded an impressive four game-winning goals in six games played. Additionally, he was one of six players named to the 2018 Gatorade OHL Cup All-Star Team. He won a tournament-high 63 face-offs, going 57.8% in the circle. The 5-foot-11, 145-pound left-handed center has been named an assistant captain for the York Simcoe Express for four straight years. He played a key role in earning three consecutive Ontario Minor Hockey Association (OMHA) championships over the last three seasons with the Express. For 14 straight years beginning in 1999, the player taken second in the OHL draft went on to play in the NHL. 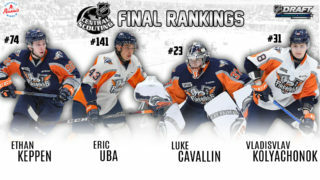 Also, since 2010, four of the last six players selected second overall in the OHL Draft became first-round draft picks in the NHL. OHL Central Scouting Report: Evan is a smooth skating center that has very good offensive instincts. He is one of the nicest skaters in the draft, has a long, powerful stride and is very agile on his skates. He has a great skill set and can makes plays at full speed. He is a smart player that understands the situations of a game and makes very few mistakes. He plays a simple but effective game. Evan was a big part of the success his team had in the second half. Fans can meet Evan at the Firebirds’ annual orientation camp April 20-22 at Iceland Arenas on Elms Rd. in Clayton Township. 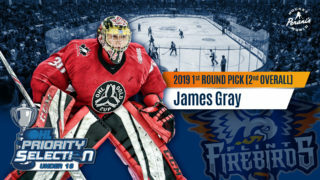 Firebirds’ newly drafted prospects from the 2018 OHL Priority Selection, prospects from previous OHL Priority Selections, as well as free agent invites and current Firebirds will be in attendance. Join us Saturday April 21 for the ‘Firebirds Tailgate Party’ from 2 p.m. – 6 p.m. featuring complimentary hot dogs and drinks, a kid’s fun zone and a special player meet and greet. Fans are invited to attend the Firebirds Blue vs. White scrimmage at 3:30 p.m. at Flint Iceland Arenas. This event is free, open to the public and will happen rain or shine.